Maria Laura GuanoLuisa Toapanta began her journey into a life of waste picking at the age of 5. Her grandfather worked at an open dump in Quito, Ecuador, and she would follow him around while he collected and sorted. “I loved it because I would find toys there,” said Maria Laura. At age 7, she began to actually work as a waste picker there. Her grandfather taught her. She’s been working as a waste picker now for 18 years. She lives on the outskirts of Quito in the district of Calderón San Luiz. Maria Laura today is an active waste picker and the president of a waste pickers’ association, Gestores Ambientales de Districto Metropolitano de Quito. It’s an association of mostly women – with 40 women and ten men. She was one of the founders eight years ago. 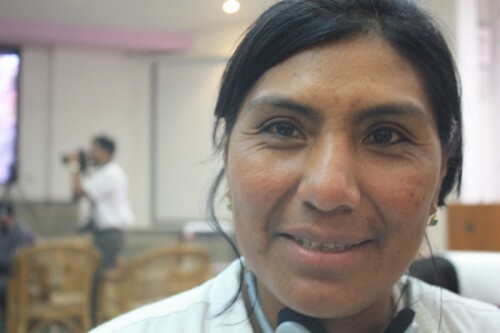 Maria Laura is also the vice-president of the Federacion de Recicladoras de Ecuador, Ecuador’s national network. Maria Laura says the global workshop is important because “we are globalizing our concerns as waste pickers.” She also learned from Pune’s waste pickers. “One shouldn’t just depend on the men for driving the cars. This can be a problem if you can’t drive. Here in India, the women drive the trucks,” she said. She also learned that with biogas, wet waste can be processed and generate energy.